Felt very blue and confused tonight so I made Banana Bread with Chocolate Chips to give myself a "mental health" break and to make my apartment smell and feel warm. I love this delicious and easy recipe from Molly Wizenberg's "A Homemade Life." The book is a very well-written, funny and touching memoir and Wizenberg ends each short chapter with one or more recipes. I cried when she wrote about her dad and I got teary-eyed when I read about how she met her husband. And of course, I love the variety and easy-to-follow sweet and savory recipes in her book. Set rack in center of oven and preheat to 350 degrees. Grease a 9 x 5 loaf pan with cooking spray or a little butter. Carefully melt butter on medium power in microwave in 15 to 30 second increments - be careful of splatter. Set aside to cool. In a large bowl, whisk flour, sugar, baking soda and salt. Then add chocolate chips and the ginger (if you're using it) and whisk to combine. In a medium bowl, lightly beat eggs. Add the mashed banana, yogurt, melted butter and vanilla and stir to mix well. Pour banana mixture into the flour mixture and stir gently with a spatula, scraping down the sides as needed, until just combined. Do not overmix. Batter will be thick and somewhat lumpy but there shouldn't be any unincorporated flour. Pour into the loaf pan and bake for 50 to 60 minutes until the top becomes a deep golden brown and an inserted toothpick comes out clean. If the toothpick still comes out with batter after 60 minutes, add 5 more minutes and check again. If the loaf seems to be browning too quickly, tent it with aluminum foil. Cool the loaf in the pan on a wire rack for 5 minutes and then tip the loaf out of the pan onto the rack to finish cooling. 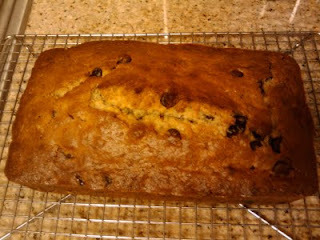 Let it cool completely before slicing...if you can resist not digging in while it's still warm. I've never had reason to put this banana bread in the freezer before because I always bake and share. However, Wizenberg notes that fulled cooled and wrapped in plastic wrap and then wrapped again in aluminum foil, the bread will be kept safe from frost and will taste delicious straight from the freezer.